After focusing their lenses on the beauties of two ancient capitals of Xi'an and Luoyang on the Silk Road last year, photographers are now being invited to discover the beauty of western China's Gansu province, where goods were transported on camelback through its magnificent deserts hundreds of years ago. The Discovering the Beauty of Silk Road project, initiated by Canon, was launched in 2014 and documented culture, landscapes, architecture and traditional craftsmen in cities in Shaanxi and Henan provinces, the starting locations of the Silk Road. 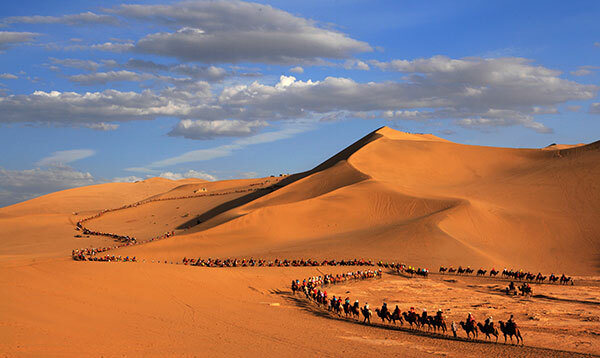 This year, photographers will go deep into six cities in Gansu province from June to October, including Dunhuang, famous for its grottoes and Buddhist murals. All photos selected will be donated to the Protection Center of China's Intangible Cultural Heritage. The six cities to be photographed are along the well-known Hexi Corridor, including Wuwei, Zhangye, and Jiayuguan, historical sites that have witnessed wars and produced legendary heroes and celebrated poets. More importantly, they were vital centers of culture, religion and arts that were spread between East and West. Ye Zhou, writer and winner of the Lu Xun literary award, says that different parts of China have started to look at the country's western areas to seek a revival of the spirit, similar to American's Westward movement 200 years ago. "Western China was once prosperous in the Han Dynasty (202 BC-220). Now when we look back to the land of deserts and dunes, we are seeking a kind of spirit that we've lost," says Ye, who has taken on the role of scholar on the photography project.